Qualifications: Yoga Therapist, 1st Class Degree in Psychology and Social Anthropology, Certified Active Birth and Pregnancy Yoga Teacher, Trained Creative Art Coach. Shweta Panchal is a yoga therapist and has been a yoga supervisor since 2015. 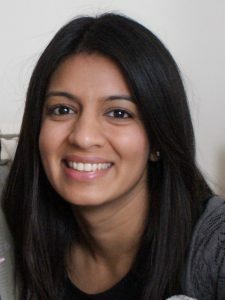 She is also a lecturer at Minded, an Active Birth Pregnancy Yoga Teacher, an Ambassador for the Pre and Postnatal Depression and Anxiety charity PANDAS,She is currently writing a handbook “Embodying The Yoga Sutras” in which she endeavours to provide an understanding of how applied yogic principles of Patanjali can be the basis for social personal transformation. She has a deep understanding of therapeutic relationship and their boundaries and she is able to adapt interventions according to physical and psychological needs and preferences. She is skilled in using the framework of yoga and mindfulness to ask clients the questions that foster insights into habitual thinking patterns and behaviour.